My Outlander gift guide is here to help newbies and die-hard fans find a wee bit o’ Scotland for their own. Disclosure: I’m affiliated with some of the websites linked in this blog post. I will make a small commission if you make a purchase, at no extra cost to you. Outlander began as a best-selling book, but now has worldwide acclaim as a TV series on Starz. The story of a WWII nurse who falls through time and marries a Highlander has captured the attention of millions fans, as well as the Foreign Press Association, who nominated Outlander for best TV drama, Caitriona Balfe (Claire) for best actress in a TV drama, and Tobias Menzies (Capt. Jack Randall) for best supporting actor in TV series. All sorts of fun Outlander merchandise is now available. 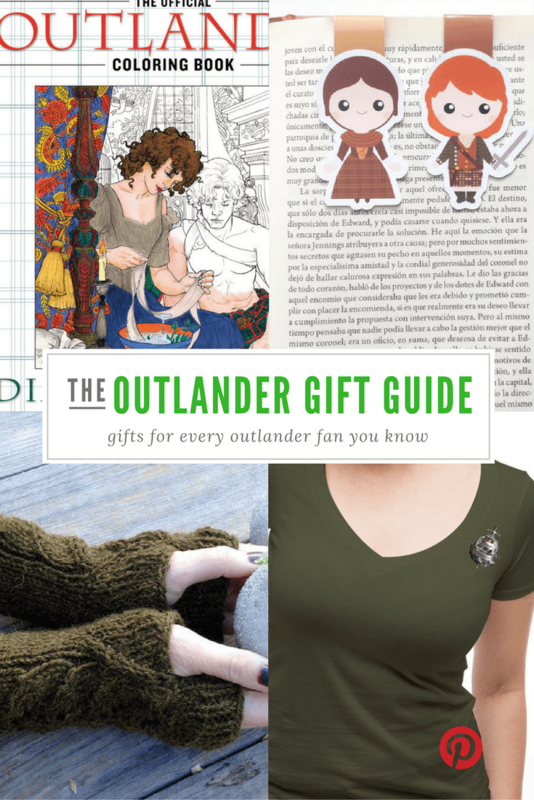 This Outlander gift guide has only a sample of what you can find online at stores that carry official Outlander merchandise, like Entertainment Earth, or on Etsy. Coloring books for adults are all the rage right now, because the idea is that spending some time coloring will relieve stress. So why not color some scenes from the Outlander TV series? The Outlander coloring book includes pictures of Claire, Jamie and Frank, as well as Craig na Dun. What could be better for an Outlander fan than a little bit to discover every day? The daily desk calendar has photos, quotes and trivia to help ye bide until #Droughtlander ends. There’s also a wall calendar with big, beautiful photos of Sam Heughan and Caitriona Balfe. The Fraser clan’s motto is “Je suis prest,” or “I am ready.” This Outlander t-shirt features not only the motto, but also the family crest. There are dozens of other t-shirts to choose from, too, with various clever sayings and even the Fraser tartan. Send your friends and family their own little Jamies and Claires with these fun pop-up note cards. You can also get official Outlander tartan note cards, as well as postcards. How adorable are these Etsy bookmarks of Jamie and Claire? Even if you’re like me and read digital books almost exclusively, they can be used in cookbooks, notebooks and journals. There are hundreds and hundreds of pieces of jewelry related to Outlander on Etsy. I could easily go broke! This is an example of a gorgeous Outlander-inspired necklace that’s taken from the context of the books, specifically a dragonfly in amber (the title of the second book). I love, love, love the fingerless gloves — almost sleeves — that Claire wears on Outlander. Lucky for me, I have a talented cousin who knitted me a pair. (I treasure them!) You can buy the official fingerless gloves with a tag that says Outlander. Or you can find just about any style and color you want on Etsy, including these cable-knit types. My Outlander gift guide has only a sample of the wonderful things you can find that display your love of Outlander. Thanks for reading! Click here to download a free Outlander cheat sheet with an episode guide, cast list and chronological reading order.